Basically if you are watching a movie and your system has a high DPC latency, your audio/video will pause or skip for a couple of seconds. The same will happen with games. The worst part is that those audio/video dropouts will occur regardless if you have a single core Pentium 4 2.4 GHz processor or a quad core Core i7. Bad coding of the drivers is usually the fault for high and very high DPC latency. For Windows XP, Windows Vista, Windows 7, Windows Server 2003, Windows Server 2008 use DPC Latency Checker or LatencyMon. For Windows 8, Windows 8.1, Windows 10, Windows Server 2012, Windows Server 2016 use LatencyMon. 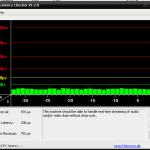 DPC Latency Checker measures DPC latency of the overall system. 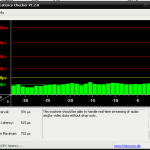 LatencyMon measures DPC latency of the overall system and of individual drivers. The DPC latency varies depending on the applications you are running (foreground and background) and it’s mostly influenced by audio data streams, video data streams and network activity (wireless, ethernet, bluetooth). But that’s not all, for example mouse movement also causes DPC latency levels to rise. When you use a P2P application and you watch a HD 5.1 movie, this can lead to a very bad movie experience, audio/video desynchronizations occurring several times during playtime. DPC latency tests done on the following configuration: Core 2 Duo 8400 3.0 GHz, DFI LP UT P35 motherboard,Marvell 1 GB Lan onboard, Realtek ALC885 audio onboard ,2×2 GB Ram, ATI HD 3870 video card, Asus Xonar DX sound card, Windows XP x64 (sp2), Windows 7 x64(sp1), DPC Latency Checker. Values are approximates. Values between 0-300µs are good, 300-500µs are OK, 500-1000µs are bad and values >1000us are terrible. Don’t compare Windows XP results with those of Windows 7. Windows 7 is a clean install where Windows XP is fully loaded with programs. After closing the programs that where running in the background, such as Rainmeter, the results for Uni Xonar low DPC latency on XP where 68 µs . As you can see Realtek did a pretty good job with their drivers, the differences are enormous between Realtek and ASUS/C-MEDIA drivers with the same settings. For those of you who don’t know, I made a version of the Xonar drivers (Uni Xonar low DPC latency) which disables Asus Audio Center from startup, resulting in a lower DPC latency at ~120µs . This doesn’t mean that if you disable autostartup for Realtek Panel you will get better results. ASUS Xonar drivers are special and issues pop-up where they shouldn’t. Update your drivers (especially audio, network LAN, WiFi, Bluetooth, TV tuner) . Try searching for them on the original chip manufacturer and not on the motherboard manufacturers page. Disable unused components like LAN, onboard audio card, Bluetooth etc. via BIOS or Device Manager. Disable High Precision Event Timer (HPET) if you are using Windows Vista/7/8/10. Update your motherboard BIOS to the latest version. Some good tips in regards to updating drivers and different performance enhancements can be read here (by Von Dach). SetTimerResolutionService (http://forums.guru3d.com/showthread.php?t=376458) helps to improve latency for Windows OS (from XP to 8.1). From my experience this tool would only be useful if you would be on Windows Vista/7/8 and if a application you would use would not signal the system that it is a multimedia application so that the system would change its timer resolution from the IDLE state. qlum: thanks, I will try it. CarvedInside: You might want to try LatencyMon, but I'm not sure how accurate it is. CarvedInside: Glad it worked. Thanks for sharing!